Is the golden age of exploration in the Himalayas dead? Mostly yes, but there remain some pockets which have escaped the attention of trekkers thanks to a variety of often unpleasant reasons. This is true for North Sikkim where the Indian military (or rather their bureaucracy) has a firm grip over the areas close to the Tibetan border for fear of the Chinese Army. However, with patience and good local contacts it is possible to trek in certain predefined areas. I am very thankful to Hishey from Discover Sikkim travel agency in Gangtok, without her this trek would not have been possible. Getting to north Sikkim takes some time. From Gangtok we drive for a day on treacherous roads, passing endless landslides, to reach Lachen in North Sikkim where we stay at the pleasant Chaten lodge for a night. 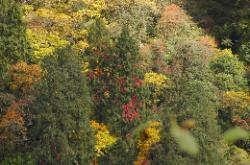 The jungle of central Sikkim gives way to connifers and decidious trees with colourful autumn foliage. Lachen is the last major settlement in the area,and though the houses have a their own style, the town has a distinctive Tibetan feel. Instead of covering a large area (for which permits are a nightmare, if possible at all), we spend ten days in the main valley of Kangchengyao. From Thangu we walk up the valley that leads to the very foot of the 6'889 m peak. We follow a meandering creek for most of the time, and it is this river Zachu that gives the area its name. In summer, herders come up to let their yaks, sheep and goats graze on the abundant grass and flowers that cover the flat plateaus and steep hillsides. In autumn, the grass becomes dry, temperatures drop below freezing point at night and the people move down to their villages. While we are up there, we enjoy a fine spell of weather with cold nights and foggy afternoons. Kangchengyao, the bearded mountain or "King Mountain", dominates the scenery. 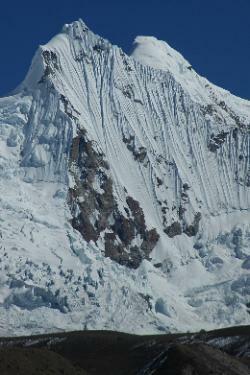 Across a large valley stands Chomoyulmo peak, his wife the "Queen Mountain". Behind Kangchengyao lies Guru Dongmar Tso, a lake visited and blessed by Guru Padmasambhava on his way to Tibet. Though temptingly close, we do not stray of our path - military presence would mean certain detection and unpleasant consequences, esp. for my local crew. The valleys in Zachu were formed by glaciers, and the shape of the valleys are all old moraines, most surprising and picturesque are the plateaus from which we enjoy stunning views. The entire chain of tall peaks that form the border between Sikkim and Nepal rise to the west, culminating in the triangular south summit of Kangchenjunga. A dozen lakes and ponds invite for day trips and the reflection on their clear surface increases the feeling that the world here consists of only the blue of the sky and the white of snow. It is time to leave the Zachu valley and find a way into the valley of Deuthang to the south. Our guide knows a pass between the edged peaks, but by the time we have reached the foot of the pass thick fog has moved in and makes orientation difficult. The bad weather front from some weeks ago has dumped a large amount of snow, we wade through high remains in search of the pass. Finally a cold breeze indicates the col to reach the valley of Deuthang. Famous lamas have meditated in the caves of the Deuthang valley, most well-known is Alexandra David Neel, the French Buddhist woman who showed extreme courage and strength on the journeys in Tibet. Deforestation has taken away some of the previous charm of the valley, but it is a nice contrast to the barren Zachu area and we spend two days enjoying the wildlife and the lush vegetation. Then, sadly, my visit in North Sikkim already comes to an end. We walk down to the road at Kelap and ride back to Gangtok. From Gangtok we take a local jeep to visit the tea gardens of Temi in south Sikkim. 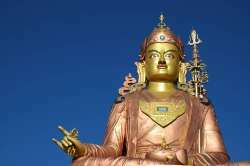 Just nearby lies Sandruptse, a "hill" on whose top stands a huge statue of Sikkim's guardian, Guru Padmasambhava. The snow and ice seems far away as we gaze at Kangchenjunga through the green leaves of the forest. The last major destination before returning to Nepal is Darjeeling. After having spent many days in Sikkim, the city does not feel that exciting, but occasionally when wandering through the narrow alleys one can feel what it must have been like a hundred years ago when traders from all over India met and major explorations of the British started here. For a proper good-bye from the mountains I get up early and watch the sunrise from Tiger Hill. While Darjeeling lies asleep in the shade, the sun rises as a red circle through the dense fog and the Kangchenjunga massif explodes in colours. It was certainly not my last visit to North Sikkim.